"Burl Ives on Spike Jones Show"
Folk music, literally the music of the people, can be a slippery concept, especially when it is applied to as big and as diverse as America. What is folk music? In OTR we enjoy several different forms of American music, Jazz, Hillbilly Music, Swing, Big Band Music, Country and Western, Classical, “Sweet” Jazz, Religious Music, Marches, even Rock and Roll. All of these musical forms were popular enough to have received sponsored airtime on network radio during the Golden Age of Radio, but does that make any of them folk music, the music of the people? Folklorists tend to classify music as “folk” if it is more associated with farms and the countryside than the cities. For musicologist Charles Seeger (Pete Seeger's dad), folk music was “associated with a lower class”. Folk music is part of an oral tradition of passing down stories from generation to generation, and folk songs have often been around so long that no one knows who their composer was. A useful definition of folk music is “songs that everyone knows”. The music of Burl Ives certainly fits that definition. Burl Icle Ivanhoe Ives was born in Jasper County, Illinois, in 1909. His father was a farmer and little Burl learned his first tunes at the elbow of his pipe-smoking grandmother. When his uncle and mother heard him singing in the garden one day, his uncle invited the tyke to sing for an old soldier's reunion in a nearby town. Burl's rendition of “Barbara Allen” impressed both his uncle and the old soldiers. Ives was a habitual joiner. He was a member of the Lone Scouts before the organization disbanded and was absorbed into the Boy Scouts of America. He took part in many Boy Scout Jamborees and was eventually awarded the Silver Buffalo, Scouting's highest honor. The Ives family were active Masons. Burl was inducted into DeMolay in 1927 and was a 33rd Degree Mason. He was also a Ham, call sign KA6HVA, which became a recognized “silent key” after he passed away. Burl was a linebacker in high school and learned to play the banjo. In 1927, he entered Eastern Illinois Teachers College to pursue a career as a football coach, but while listening to a lecture on Beowulf during his junior year he suddenly realized he was wasting his time. He walked out of the classroom (slamming the door as the professor made a snide remark), slung his banjo over his shoulder, and hit the road. The early years of the Great Depression were hard for everyone, but they were seminal for a young folk singer on the road. He played when he could find an audience, worked odd jobs, and learned songs wherever he could. In 1931, Burl found a job singing on WBOW Terre Haute and went back to school at Indiana State Teachers College. Later in the decade he attended the Juilliard School in New York. Folk music was becoming more and more of a political statement during the Depression. 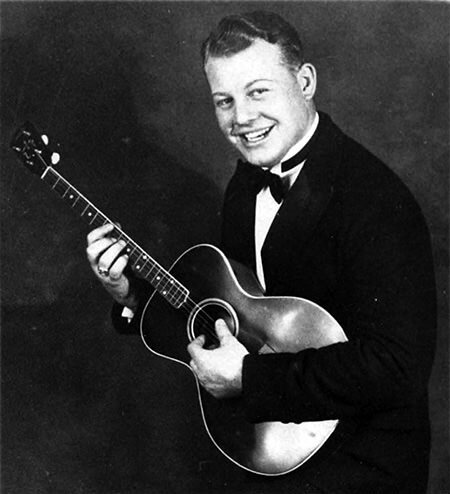 Burl had his own radio show, The Wayfaring Stranger, in 1940, featuring traditional folk songs. He was associated with the Almanac Singers for a while. The Almanacs included Woody Guthrie, Will Geer, Millard Lampell and Pete Seeger. The group was active in the American Peace Mobilization, which opposed America's entry into the Second World War. The APM was founded from the remains of a branch of the Comintern, and refashioned itself as the American People's Mobilization in June of 1941 when Hitler invaded Russia. Now the APM was calling for America to immediately join the Allied cause. Burl's draft number came up early in 1942, and he served at Camp Dix and Camp Upton as part of the cast of Irving Berlin's This Is The Army. He transferred to the Army Air Force when the show went to Hollywood and was honorably discharged as a corporal due to medical reasons in September 1943. In December, he took a job at CBS's New York studios for $100 per week. Ives stayed with CBS through the 1940s, as well as some appearances on AFRS. He got his start in the movies in Smoky (1946), playing a singing cowboy. As the 1950s were dawning, Burls’ show business career was beginning to hit full stride until he was named in Red Channels and accused of having Communist affiliations. Given the importance of folk music to the American labor movement, the accusation is hardly without merit. Some folk singers were pinker than others, but it is hard to understand the connection between “Jimmy Crack Corn” and trying to overthrow the nation. In any case, when called before the House Un-American Activities Committee, Ives chose to cooperate by “naming names”. As a result, Burl’s name was removed from the blacklist and he was able to continue with his movie career. Naturally, his folk singing friends considered this to be a betrayal, especially Pete Seeger. Ives maintained that by cooperating with the HUAC he was merely doing his duty as a good citizen. Seeger and Ives finally reconciled enough to appear on stage together in 1983 at a benefit concert in New York (Burl by now was confined to a wheelchair) and harmonized on “Blue Tailed Fly”. Ives’ film career took off during the remainder of the 1950s. He played Big Daddy in Cat on a Hot Tin Roof (1958), won the Academy Award for Best Supporting Actor in The Big Country (1958), and had his abdomen filled with marbles in the climactic scene of Ensign Pulver (1964), a sequel to Mr. Roberts. In 1964, Burl voiced Sam the Snowman in the Rankin and Bass Christmas classic, Rudolph The Red Nosed Reindeer. Although his recording of the title song never sold as well as it did for other artists, but “Holly Jolly Christmas” and “Silver and Gold’ have become perennial Christmas favorites. 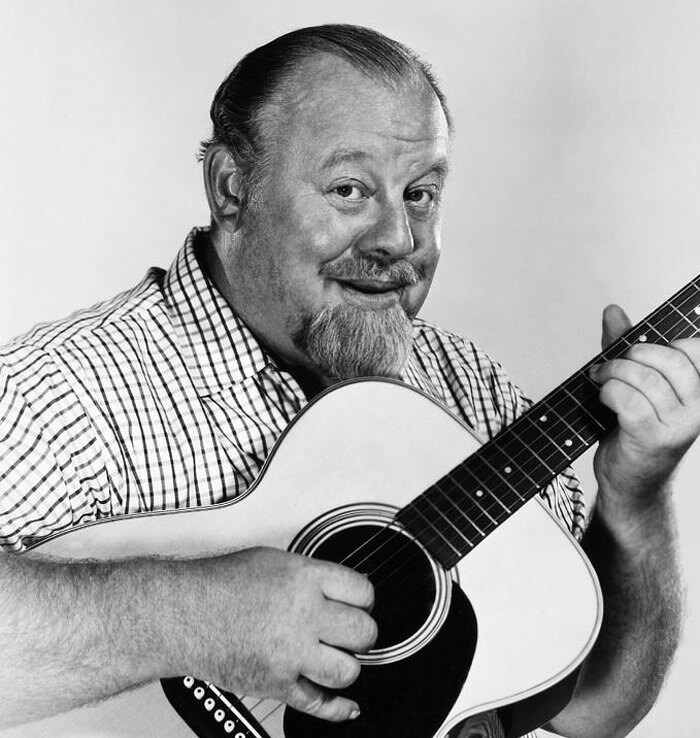 Burl Ives had a hard beginning, bumming his way across the country in the 1930s with just a banjo and a song. Then his first radio broadcast was in 1940, and was interrupted by a radio bulletin about the fall of France. But he picked himself up and kept on plucking until he landed his own show later that year. He went on to become a well-known actor and did many guest appearances on other radio shows, including Bing Crosby's show as well as Martin and Lewis, Spike Jones, and Command Performance. Be the first to comment on "Burl Ives"